Guthrie, 1890-1910. 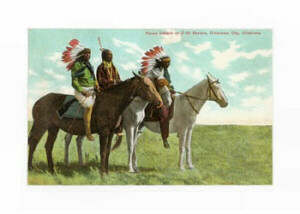 Oklahoma City, since 1910. 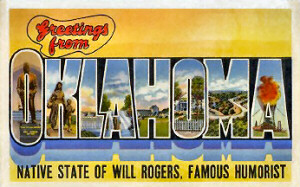 November 16, 1907, 46th State. Oklahoma Geography, 69,903 square miles. 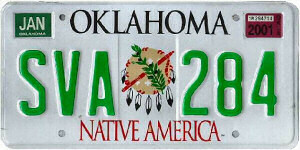 Constitution: Oklahoma Constitution, 46th state to enter the Union. Mining: Oklahoma's most important mined products are, by a good margin, petroleum and natural gas. The state ranks among the leading producers in the country. Other mined products are coal, crushed stone (limestone quarries), iodine and sand and gravel. Iodine is not produced in any other state. 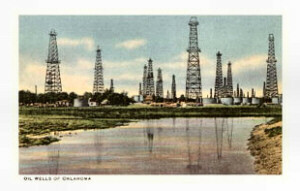 Manufacturing: Production of machinery, particularly oil field machinery, leads the manufacturing industry in Oklahoma. Construction machinery, machine parts and refrigeration and heating equipment are other types of machinery manufactured in the state. Transportation equipment (aircraft and aerospace	equipment, automobile assembly) ranks as the second most important manufacturing activity in the state followed by a variety of other items including computer and electronic equipment (electronic components, military communication systems, telephone equipment), fabricated metal products (structural metal), processed foods (meat-packing plants, animal feed, bakery products), and rubber and plastic products (tires). Services: In the services industry, the community, business and personal services group leads the way with private health care, equipment rental companies (oil field equipment, rental cars), telemarketing firms (telephone reservation systems) and repair shops. Ranking next are the wholesale trade (food products, grain, oil and gas, transportation equipment) and retail trade (automobile dealerships, discount stores, food stores, service stations) industries along with government services (public schools, hospitals, military bases). The third most important service industry in Oklahoma is the finance, insurance and real estate group, fueled by costs associated with the transfer of property and increasing demand for office space. Highest Point: Black Mesa, 4,973 feet above sea level. Lowest Point: Little River, 289 feet above seal level. Natural Resources: Oklahoma's fertile soil, abundant water and fine growing climate form the foundation of a strong agricultural economy. Vast mineral reserves of petroleum (among the largest in the country) and natural gas make Oklahoma a leading mining state as well. 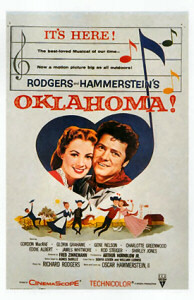 Oklahoma House: Oklahoma State Representatives.